I wish I had money to burn, I would love to be able to afford the mega expensive original Blue Note LP's. Since I am a man of modest means, I have to accept the fact that those incredible finds are few and far between, but oh so rewarding when they happen. 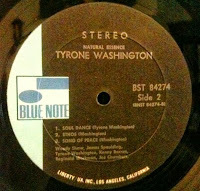 One way you can collect Blue Note is by collecting Liberty second and third pressings, and in some cases 4th pressings. Any record after 1966 that has the Liberty Address on the label will be quite affordable and as you get into the 70's United Artists issues they can be very reasonable in price. Most of the records I have found were in the $5 to $50 range, obviously if you are buying on eBay you will pay probably in the $15 on the low end for a Liberty pressing. You can find these Post 1966 Blue Note's in the record stores at even better prices, sometimes though, a record shop will not know the difference between the pressings and still have a crazy price on a 20 dollar record. You can learn much more about collecting the cheaper, but still great sounding liberty Blue Note issues here.